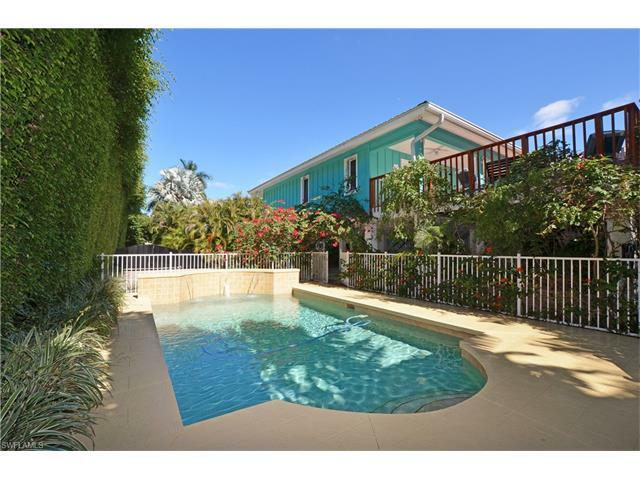 Located in the walkable center of downtown action, this home is just 6 blocks to the white sand beach, 2 blocks to cambier park tennis, art, and theater, 3 blocks to both 3rd and 5th shops and dining, and 1 block to st. Anns school. The exterior features a wrap-around new orleans balcony with a descending staircase from the upstairs entry. There is a complete home on the second floor with 3 bedrooms, 2 bathrooms and an eat-in kitchen. The lower level has living quarters and a bath. Whether it becomes your primary residence, or a rental investment property, the lot, on a 125 x 75 parcel, is poised for an outstanding old naples dream home. See realtor for potential plan. Charming two-unit residence providing the best of all worlds in old naples - a home where your family can make wonderful memories, with income, or a quality investment property with an income stream that has been excellent and full of potential. This fine property is a classic old naples home located in a one of a kind spot thats a stones throw from 5th ave. South, and a quick walk to 3rd st. South. The two-bedroom unit has a spacious living room, cute florida room, eat-in kitchen, two baths, and laundry. The one-bedroom unit offers a generous living room, galley kitchen, one bath, and a laundry room. Both units have an excellent rental history. A cute yard, and a two car garage complete the property. Stroll to the beach, go paddle boarding or kayaking, bike everywhere from this fine location. A casual walk to end each day can bring you to all that old naples offers beautiful natural resources, the waterfront, the outdoors, public parks, city dock, dining, and shopping. Available today! Spectacular light-filled three-bedroom old naples cottage with high ceilings. The large great room floor plan flows gracefully from one engaging space to another. Three spacious bedrooms and large living area are all situated on one level. Each bedroom in the home offers a comfortable and private retreat area for family and friends. Numerous french doors lead out to a spacious deck and outdoor area allowing the interior living spaces to blend harmoniously with exterior spaces and the surrounding lush vegetation. This home lives like a sublime resort wrapped in lush landscaping. Move-in ready and located in the heart of naples, this spectacular property offers a rare lifestyle opportunity nestled just blocks from the celebrated beaches of naples, florida and within a short distance to the internationally recognized cultural district of fifth avenue south, and third street south. This property is a must see. This floorplan is the palm cottage it is a pre-construction opportunity on lot #4 in mangrove bay, new luxury homes in a waterfront community, along the gordon river. Superior construction features and luxury appointments throughout this single-story residence encompassing approx. 2,514 sf under roof and a 3-bedroom, 2. 5 baths floor plan include (but not limited to) solid standing seam metal roofing, natural gas, hardwood floors throughout entire home, custom crafted cabinetry, thermadore appliance package, volume ceilings in the living room and master bedroom suite, private pool, outdoor kitchen, outdoor fireplace, electric screens on lanai and hurricane rated doors and windows. Old florida inspired architecture, designed by mhk architecture & planning, with gulf access private boat slip included with the purchase. Full concierge services and amenity building (completion late 2019) with private on-site storage for resident kayaks/paddleboards and/or jet skis, private community boat ramp and a wellness center with state of the art workout equipment. This charming seaside cottage was completely rebuilt in 2011 by an award winning architect and has just undergone a brand new $50k pool and patio build this summer by nassau pools. Located on a quiet tree-lined street in olde naples, it is the epitome of the naples lifestyle with the beach within walking distinct and 5th ave south steps away. This home offers three generous bedrooms plus den and three full baths. Custom bamboo floors, tongue and grove ceilings, outdoor kitchen french doors, bose surround sound system and impeccable design details make this coastal chic property a true naples gem! One can access the home by the front circular driveway or black alley which services the two car garage. Begin sold furnished, the home is filled with magnificent and custom made coastal art and furnishings that really showcase the treasures of florida and our beachfront town. Come escape and enjoy all that this unique property has to offer! Click on the virtual tour above. Location, location, location. A one-of-a-kind single family home with 3 bedrooms+office/2bathrooms, 2463sq ft under air, just 1 block from the fine dining and shops of fifth avenue and three blocks from the beach. Buildable lot area 8100 sq. Ft. 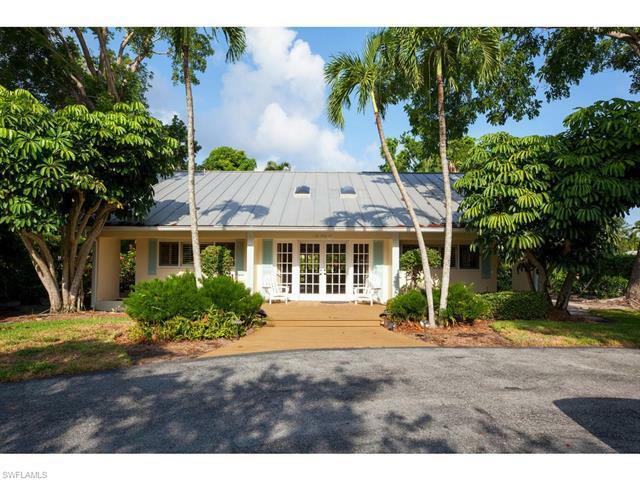 Complete seclusion with absolute privacy and tranquility surrounded by lush vegetation. No other house can be seen and no nosey neighbor can see you. Enjoy outdoor dining on the deck or relax by the pool. Metal roof, hurricane proof windows and doors. New onyx floors in all living areas and bathrooms, wood floors in the bedrooms, granite counters, kitchen and bathroom cabinets, base board, crown molding, solid doors, closets, wired smoke detectors, retractable door screens. A/c system and water heater one year old. Parking space for five cars under the house and another five cars outside, great storage space for boats, trailers, jet skis, motor bikes. Remote controlled front gates. The under house area can be built out and incorporated into a 5000sq. Ft single family home. Surge proof. Paradise is truly found. C. 12740 expect the unusual! This elegant, refined, detached villa home lives like a single family home and is only block off naples fabled 3rd street s. Shopping and dining district features: 3 bedrooms (20 x 15 master); 3 baths; 3-car partially air conditioned garage (prewired for additional car lift options); 2 gas fireplaces; amazing kitchen with 5-burner gas cooktop, top-of-line appliances including miele and sub-zero, volume ceilings; hardwood and carpeted floors, tiled bathrooms; impact glass french doors; continual flow hot water throughout entire home; tanoy commercial grade ceiling speaker system; camera security and honeywell alarm security system; 3 skylights; 3 huge lanai areas; master bath includes large walk-in rain shower, neptune japanese soaking tub, caesar stone vanity tops, bidet and oversized walk-in closet; spiral staircase to roof to view fireworks over the naples pier; many built-ins; low condo fee with ground maintenance included, new 2nd floor a/c (2016); quality finishes throughout; major rental opportunities and much more. Make sure to view the video in the virtual tour url, above. H. 13997 great building sites come and go and in old naples they disappear with great frequency. This home and building site is a simple stroll to the beach and close to many of the amenities that make the village life so coveted. At this point in time, there is not another opportunity this close the beach for a price under $2 million. If you have a buyer looking to build in old naples, this private, landscaped lot will allow him to build a home and at completion, have built-in equity. Thats win, win all the way around. Were more than happy to provide a complete market review to show you why this is an opportunity not to be missed. H. 12971 - significant price reduction, motivated seller, bring offers! Paradise found! Located in the heart of olde naples is where you will find this beautiful private oasis on a corner lot just minutes from everything that naples has to offer. The naples beach hotel, 5th avenue, the pier, naples hospital, wynn's market, and some of the best eateries and shopping are just minutes away. Enjoy the tranquil secluded outdoor space or take a stroll to some of the finest beaches in the world. This home boasts over 3300 square feet of living space, three master suites, gourmet kitchen with gas, pool, spa, outdoor kitchen, three car garage and much more. This property also has an excellent rental history generating $15,000-$18,000 a month in season. If olde naples is where you want to be this one is worth a look! Now available-remodel now finished,! Arguably one of the best locations available in the community of royal harbor. Located on a private cul-de-sac sits this over-sized lot w 150+ feet of water frontage! Highly desirable southern exposure leaves yard/pool deck sundrenched. Boaters will appreciate the quick no-bridge access to the gulf of mexico & the additional sea wall space for 2+ vessels and/or jet skis. A total renovation has transformed this home from a/c duct work to every small detail. Open floor plan with interior features such as large kitchen island with seating, quartz counters in kitchen and baths, high end appliances, custom vanities and cabinets, beautiful tilework and exquisite ceiling details. Brand new impact glass windows/sliders, in-ground pool and spa plus freshly installed yard and landscaping. Fabulous intersecting canal view. As of today, 4/26/2019 the average home price for homes for sale in Naples is $910,004.